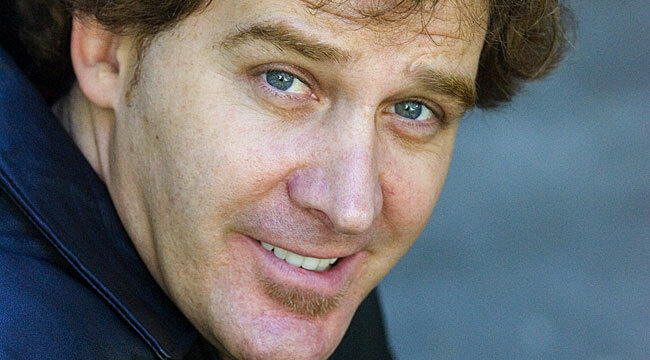 Inspired by loudmouth comics like Andrew Dice Clay and Sam Kinison, comedian Jim Florentine ditched his gig as a radio DJ to start doing standup comedy in the early ’90s. Eventually an album of crank phone calls led to regular appearances on The Howard Stern Show. Now, Florentine keeps plenty busy. He’s the co-host of That Metal Show on VH1 Classic and has had recent appearances on Girls, Californication and Inside Amy Schumer. He called us from his New Jersey home to talk about his career. You started your career way back in the early ’90s. What made you first want to do stand-up? I saw Kinison and Dice get up on stage. I was more into music at the time. I was a DJ on the radio and in clubs. I always wanted to be in bands. When I saw Eddie Murphy do Madison Square Garden and bring a rock star mentality to his show, it really attracted me. I thought I could do that. I was a wiseass with the one-liners. I wasn’t the class clown. That’s what most comics are like. They sit back and observe and think evil things. Do you remember your first stand-up gig? Yeah. I had a bunch of material. I was petrified to get on stage even though I was DJing at the time. I was on vacation in Florida with my girlfriend and I saw an ad for an open mic night. I ruined the whole vacation because I spent two nights on the beach pacing up and down, trying to memorize my lines and being all nervous. I wanted to do it in front of people who didn’t know who I was. She broke up with me a week later. She paid for the trip, so who cares? What was the show like? I didn’t do well but I ripped on the crowd. Some guy in the audience yelled something out and I ripped on him. Half of my material was done but I got a few laughs ripping on this guy in the crowd and that felt really good. At what point did you start making the crank calls? I did that years later. I had a couple of comedy shows at night but during the day I had nothing going on. If telemarketers called I would try to stay on the phone with them as long as I could. It was out of boredom. I started putting out CDs with that material. And then the Crank Yankers’ gig came a week later. I had no idea what would happen with it. Was that a turning point? I put the CD out and then got a spot to go on The Howard Stern Show. This was when Jackie “The Joke Man” left and they were having unknown comics come in. It was perfect timing. My manager convinced them to have me in. [Stern] started playing me constantly. And then Jimmy Kimmel and Adam Carolla were looking for guys to do prank calls and called me up. I didn’t even know who those guys were. What was it like working with Eminem? We found out he was a fan of Crank Yankers. Next thing you know, his manager called Comedy Central and wanted to be on the show. His daughter watched the show and that was a way for them to bond. They would watch it every Tuesday night or whatever. His manager told me he wanted to do calls with that guy who does Special Ed and Bobby Fletcher. He wanted us in Detroit for three days so we packed up our stuff and went out there and recorded with him in a studio. It was great. I was never a big rap or hip-hop guy but I liked Eminem. He didn’t write the same goofy stuff about being in a club and having his bling and all that crap. It was nerve-racking to meet him. I didn’t want to piss him off otherwise he’d write a whole album about me – I’d be public enemy no. 1. I saw him and realized he was just a person. We talked about prank calls for about an hour. He knew them all by heart. He was the fanboy. Talk about what it’s been like doing That Metal Show. It’s been good. I grew up with that music. I still like it. I don’t have to do any research because I know all about these bands. There are questions I wanted to ask them for years. As a kid, I loved going to see Ozzy or Judas Priest. It’s been great. It’s a whole other audience. People didn’t know that we did stand-up. Now we have dudes sitting in our audience wearing Iron Maiden shirts. Who’s been one of your best interviews? Every season is someone different. Brian Johnson from AC/DC is great. Marilyn Manson is great. He’s so politically incorrect. I love it. Steve Harris from Iron Maiden. Rob Zombie has been on a bunch of times. It changes all the time. Who’s your favorite new band? KING 810 from Flint, Michigan. It’s evil. It’s like early Slipknot with a little Korn in there married with some Manson. Today’s metal isn’t as good, is it? It’s not as good but there is good stuff coming out that no one really hears, which is disappointing. America especially just wants to hear hits and stuff that they know. They don’t want anything new. It’s frustrating to see bands when they just do the hits. When AC/DC or Sabbath are gone, who is going to be the band to take their spot? Metallica will still be around. Avenged Sevenfold comes close. Slipknot comes close. But who’s going to sell arenas out in 20 years? Foo Fighters aren’t metal but I would throw them in there. I don’t think if there’s a big interest in metal. My nephew is in high school. He knows two other kids in the whole school who are into metal and he’s in white suburban New Jersey. I thought Mastodon would get bigger. Yeah, they’ve peaked. They’re a solid band but I don’t see the selling out 20,000 seats in a few years. It’s frustrating because if this stuff had come out in the ‘80s, it would have been huge. Ozzy doesn’t have much left. He’s 65 right now. It’s tough on those guys to tour. Last time I saw Black Sabbath, they sounded great. But they’re not doing a lot of shows. They’re taking it easy. What do you have in the works? I just go out here and there on the weekends. I’ll come into a town on Thursday and do shows Thursday through Sunday. I just filmed a comedy special about a month-and-a-half ago. It’s getting shopped around and hopefully Netflix or Showtime will take it. I have that coming early next year. I did an episode of Californication. I did an episode of Girls and Amy Schumer’s show on Comedy Central. I also have a part in Amy Schumer’s movie, which comes out next year. She filmed it in New York over the summer. I saw her last week; she said it was just getting edited. She said it was really funny. I’m looking forward to seeing it. Jeff started writing about rock ’n’ roll some 20 years ago when he stood in the pouring rain to hitch hike his way to see R.E.M. on their Life’s Rich Pageant tour. Since that time, he's written for various daily newspapers, alt-weeklies, magazines and websites. Feel free to comment on his posts or suggest music, film and art to him at jeff@whopperjaw.net.